The Tsushima leopard cat (Prionailurus bengalensis euptilurus). Photo from Nature Conservation in Japan. Those of you who have read Antoine de Saint Exupéry's book The Little Prince may recall a scene near the beginning of the book describing the discovery of B612, the asteroid the Prince lives on. The asteroid is first observed by a Turkish astronomer, who travels to a European academy to present his discovery. Arriving in his traditional Turkish garb, he is ignored by the European academics and returns home unrecognised. A year later, the same Turkish astronomer returns to the same academy and presents the exact same data, but this time wearing a European suit and tie. This time, he is applauded for his remarkable discovery. The ideal of science is that, as scientists, we should be completely objective in our judgements, and not allow our personal biases to affect us. In reality, of course, those personal biases can be very difficult to avoid. National pride and other such factors often have a stronger hold on us than we may realise. Taxonomy is a branch of science in which a certain degree of subjectivity is all but unavoidable, and personal biases can often affect whether or not a given author will accept the validity of a given taxon. The best-known example of this lies in the conflict that supposedly exists between "splitters" and "lumpers" - those who would tend to emphasise the differences between taxa and those who would tend to emphasise their similarities. In reality, of course, a given author may be both a splitter and a lumper depending on circumstances. All that connects only tangentially with my subject in this post, but it may go some way to explaining how my subject came about in the first place. On my bookshelf at home I have a copy of Iwahashi's (1992) Reddo Deeta Animarusu ("Red Data Animals"), a guide to Japanese endangered animals (both vertebrates and insects). In the mammal section are listed a number of species that I have not seen listed in non-Japanese sources, and I've always wondered what exactly they were. While I have often flicked through the book and admired the many wonderful photos in it, my Japanese abilities (which are just about extensive enough to let me read Dr. Slump and Doraemon) are not sufficient for me to follow the text. Today, I decided to see if I could find out what these species may be. Cervus pulchellus Imaizumi, 1970: Tsushima-jika ("Tsushima deer"). Tsushima is a island about midway between Japan and the southern end of Korea. I've not been there, though I have seen it from the ferry between the two countries. If the deer found on Tsushima represent a separate species, then a publication date as recent as 1970 would make it one of the most recently described large mammals, especially in as densely populated a region as Japan. As it turns out, prior to 1970 the Tsushima deer were regarded as belonging to the Honshu (the main island of Japan) subspecies of sika deer Cervus nippon centralis, before Imaizumi distinguished them as a separate species on the basis of features such as a narrow constriction of the jugal bone of the skull, a deep emargination of the nasal bone, and a longer first antler segment. Molecular studies cluster Tsushima sika among other Japanese sika (Nagata et al., 1999). However, they also find a distinct divide between northern and southern sika, which Groves (2005) formally recognised as two separate species - Cervus nippon for the southern sika (including C. pulchellus as a distinct subspecies) and C. yesoensis for the northern sika (including C. centralis). Most interestingly, deer assigned to C. nippon centralis from southwesternmost Honshu were found by Nagata et al. (1999) to also not belong to that taxon, but instead clustered with the Tsushima sika. According to Groves (2005), the dividing line between the two species is west of Biwa-ko, the large lake on Honshu. 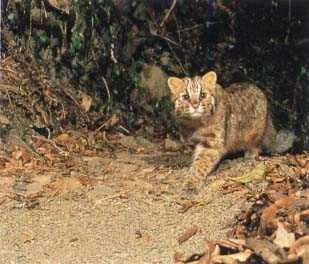 Felis euptilura Elliot, 1871: Tsushima-yama-neko ("Tsushima mountain cat"). Despite the name, and unlike the deer, this taxon is not restricted to Tsushima - it is also found in Korea and Far Eastern Russia. It appears that most authors would include this taxon as a subspecies in Prionailurus bengalensis (or Felis bengalensis), the leopard cat of eastern Asia, and recognition of euptilura as a separate species is restricted to Japanese and Russian sources. However, molecular analysis of leopard cat populations by Tamada et al. (2008) did find a clear distinction between northern populations (Tsushima, Korea, Siberia, China and Taiwan) and southeast Asian populations. If these genetic differences indicate a specific distinction, Prionailurus euptilurus may yet be a valid species. Sus riukiuanus Kuroda, 1924: Ryuukyuu-inoshishi ("Ryukyu boar"). In most places, this small boar from the Ryukyu Islands becomes a subspecies of Sus scrofa, the Eurasian wild boar. Mind you, as pointed out by Groves (2007), "Sus scrofa" as generally recognised covers a wide range of variation and a number of quite distinct subspecies, and the potential that it should be divided into more than one species should be considered. One interesting detail - genetic analysis indicates that the Ryukyu boar is not closely related to Sus scrofa leucomystax, the boar of the Japanese mainland, and the two subspecies represent separate colonisations from the Asian mainland (Watanobe et al., 1999). A somewhat gaunt-looking reconstruction of Canis hodophilax, taken from here. Though the site says that the artist responsible for this reconstruction is unknown, it bears a distinct resemblance to the mount shown on this page. Canis hodophilax Temminck, 1839: Nihon-ookami ("Japanese wolf"). Actually, I'd heard of this one before I acquired the Iwahashi book. 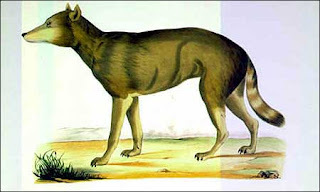 Canis hodophilax (sometimes spelt 'hodophylax', but as demonstrated by Harper, 1940, the spelling with an 'i' is correct) is the wolf of Honshu that is, regrettably, now extinct (officially around 1905, though it may have survived until later) as a result of the introduction of rabies and habitat alteration (Knight, 1997). Hokkaido, the northern island of Japan, was home to a distinct wolf taxon, Canis lupus hattai, also now extinct. Opinions differ about whether C. hodophilax was a distinct species or a subspecies of Canis lupus, but whatever its ranking it was certainly a distinctive animal. Canis hodophilax was the smallest known wolf taxon. Most sources attribute this to island dwarfism, but I'm personally a little suspicious that Honshu is small enough to cause significant dwarfism, and I wonder to what degree its mountainous habitat was a factor in its small size. In contrast to the poor opinion wolves have been held in elsewhere in the world, the shama-inu seems to have been regarded quite favourably by most Japanese. Wolves controlled numbers of deer or boar that might have otherwise damaged crops. Unfortunately, rabies was introduced to Japan in the late seventeenth century. Even more significant was probably the abandonment of mountain villages for the lowlands as the population of Japan increased and the country became more intensively agronomised (or whatever the word is), resulting in the loss of previous areas of high prey animal populations. As an aside, the specific name of the Honshu wolf translates as "trail-watcher", and may refer to a Japanese tradition of a wolf appearing near a traveller on the road at night. In a somewhat Orphean manner, turning to look at the wolf would cause it to attack, but if the traveller let it be then the wolf would protect them until they reached their home, at which point it would simply disappear back into the woods. Groves, C. 2005. The genus Cervus in eastern Eurasia. European Journal of Wildlife Research 52: 14-22. Groves, C. 2007. Current views on taxonomy and zoogeography of the genus Sus. In Pigs and Humans: 10,000 years of interaction (U. Albarella, K. Dobney, A. Ervynck & P. Rowley-Conwy, eds.) pp. 15-29. Oxford University Press. Harper, F. 1940. The nomenclature and type localities of certain Old World mammals. Journal of Mammalogy 21 (2): 191-203. Knight, J. 1997. On the extinction of the Japanese wolf. Asian Folklore Studies 56: 129-159. Nagata, J., R. Masuda, H. B. Tamate, H. Hamasaki, K. Ochiai, M. Asada, S. Tatsuzawa, K. Suda, H. Tado & M. C. Yoshida. 1999. Two genetically distinct lineages of the sika deer, Cervus nippon, in Japanese islands: comparison of mitochondrial D-loop region sequences. Molecular Phylogenetics and Evolution 13 (3): 511-519. Tamada, T., B. Siriaroonrat, V. Subramaniam, M. Hamachi, L.-K. Lin, T. Oshida, W. Rerkamnuaychoke & R. Masuda. 2008. Molecular diversity and phylogeography of the Asian leopard cat, Felis bengalensis, inferred from mitochondrial and Y-chromosomal DNA sequences. Zoological Science 25 (2): 154-163. Watanobe, T., N. Okumura, N. Ishiguro, M. Nakano, A. Matsui, M. Sahara& M. Komatsu. 1999. Genetic relationship and distribution of the Japanese wild boar (Sus scrofa leucomystax) and Ryukyu wild boar (Sus scrofa riukiuanus) analysed by mitochondrial DNA. Molecular Ecology 8 (9): 1509-1512. As an aside, the specific name of the Honshu wolf translates as "trail-watcher", and may refer to a Japanese tradition of a wolf appearing near a traveller on the road at night. Reminds me of this supposed close encounter. And funnily enough, the rule in the Japanese story that you're not allowed to look at the wolf that's accompanying you makes it debatable whether its there in that case as well. Very interesting post. It seems to me that traditional taxonomy (including alpha taxonomy) may be especially prone to this sort of regionalism thanks to widespread failure to agree on what, exactly, certain types of taxon (e.g., species) are supposed to constitute. So it's not that people are unable to overcome their cultural backgrounds to agree on the science, it's more that cultural backgrounds are posing as science. A ringed tail is kind of odd for Canis, no? Of course, if it's based on that mount, it may be a trick of the light + fading. So it's not that people are unable to overcome their cultural backgrounds to agree on the science, it's more that cultural backgrounds are posing as science. The idea I had in mind, which is roughly similar, was that in cases of debated taxonomic status, authors might be more inclined to accept a higher status for organisms from their own country, while they might take more of a lumper's approach to taxa from other countries. One other complicating factor - some countries, such as China and Korea, are home to taxonomic workers who are quite active but may have little contact or opportunity to work with researchers outside their own country. This can lead to inflated species lists as specimens are only compared with species already described from that country, and an identity with a species described from another country may be missed. Good points--it'd be interesting for someone to do a study on that.